In a women’s life wedding day is considered to be the most important day of her life, due to which she starts giving high importance to each and every aspect that is some way or the other attached with the big day. Along with the dress, makeup, venue and the ring, hairstyle also has its distinctive importance, which is never ignored by the bride. Brides who have medium length hair are lucky enough to try any sort of hair styles, which can make them look classy, stylish and beautiful. While deciding the hairstyle She should keep in mind few things with the help of which they can experience extraordinary look or else She might end up with a disastrous look. Your hair length is medium so you have enough boundary to try any sort of hairstyle which is why other things should be considered first before you make a final decision related to your hairstyle. What sort of wedding are you planning to have is it a formal wedding in a church or at a formal venue, or is it a casual wedding in other words a semi-formal wedding scheduled in a garden. The nature of the event can impact a lot so you have to be very careful. If the wedding is a formal then you should try giving you hair a formal look. You can have loose curls which should remain below your chin. In formal hairstyles for wedding you can also have high or low head buns, they will give a classy look. In the category of buns if you choose the , then you are definitely making a right choice. Another ideal look for formal hairstyle is the queen hairstyle. This kind of hairstyle is considered as an ideal choice because you can make the look extravagant with the help of accessories and you will be able to portray a royal look. 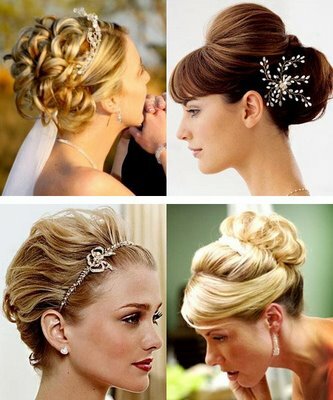 When we come to casual hairstyle on weddings it means the wedding is held in the daylight and the venue is a garden. You should let your hair open and give them an effortless look. Have loose curls then pass your fingers though your hair and leave them open, you will be able to attain an elegant look. To give a complete look you can wear head bands as well. In casual hairstyles for brides effortless braids are also in fashion. There are various braid styles which you can choose according to your dress and which suits you according to your face shape.